Brought to you by Cressey Development Group, the pre-construction Richmond Cadence condos will feature some of the most eco-friendly and healthy condominium residences in the Lower Mainland. Marketed as Richmond’s healthiest homes, Cadence Oval Village offers premium Penthouses, 1, 2 and 3 bedroom concrete homes in the desirable Oval Village Richmond neighbourhood. Walk to the beautiful waterfront, relax in the rooftop garden lounge and delight in your home’s health-focused details that give you cleaner air, pure, more refreshing drinking water, air conditioning for your own unique comfort and a quieter living experience. 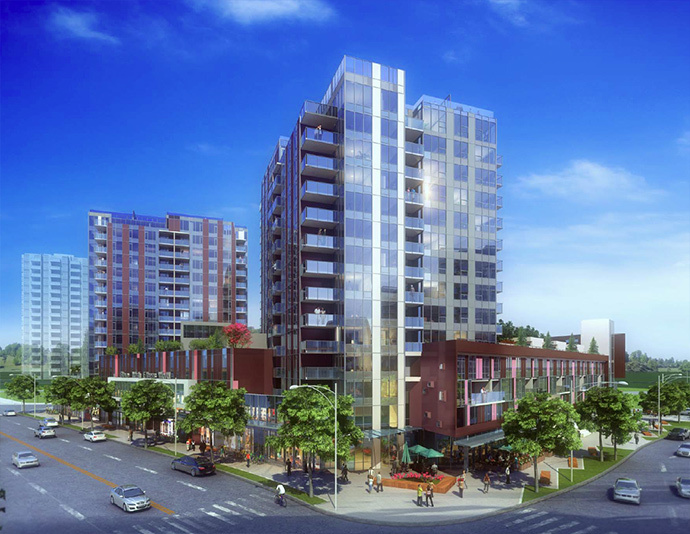 Launching Spring 2014, the new Cadence Richmond Condos in the Oval Village neighbourhood will offer 2 residential boutique style buildings that will present approximately 250 homes for sale. The Cressey Richmond Cadence Condos will feature floor plans that range from spacious studio/1 bedroom suites all the way to family sized three bedroom residences in addition to top of the line penthouse residences. Each of the homes for sale will deliver the superior design and quality craftsmanship that you’ve come to expect from Vancouver’s leading builder, Cressey Development Group. BE RICH IN HEALTH. Coming soon – Richmond real estate’s healthiest new homes brought to you by Cressey. Register now at www.cadencebycressey.com for more information as it is released. The Oval Village Richmond Cadence condo project is one of the most exciting new developments in this growing neighbourhood. This self-sustaining and eco friendly community will feature Cadence by Cressey, a residential boutique building that will feature some of the most healthiest and most environmentally friendly finishes and features. Extremely beautiful interiors, striking architecture and fantastic amenities make Cadence Richmond Oval Village condos the place to call home. Advanced VIP Previews will be starting in early 2014 so stay tuned! Other high quality finishes at the Oval Village Richmond Cadence Condos by Cressey include the famous CresseyKitchen that has become renowned for its functional walk through layout, lots of storage space and polished quartz counters, marble backsplashes, wood grained laminate cabinetry and integrated high-end Euro appliances. In addition, all homes will have energy efficient forced air heating and cooling system. 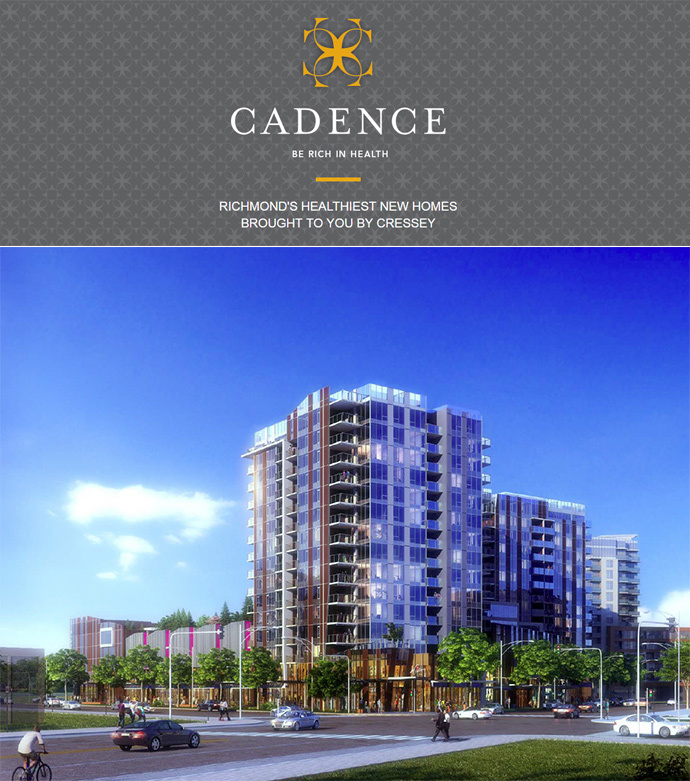 The healthy homes at Cadence Richmond condos will also feature an on-site amenity centre which will have a large Sports Court, luxurious rooftop garden with lounge, a Steve Nash Fitness World, steam rooms, game and meeting rooms, as well as street level boutique shops and grocery stores. Part of a healthy community is the liveability, walkability and proximity to work and play. Here at Richmond’s Oval Village neighbourhood, Cadence condo owners will be very close to everything within Richmond and the YVR. The Richmond Oval is 3 minutes away whilst T&T Supermarket is just a minute away from your front door. 2 minutes away is Minoru Park and all the recreational facilities there and a future city park will be completed in the next year. Steveston is 12 minutes drive away and the SkyTrain network will allow Oval Village Richmond Cadence condo owners to get to No. 3 Road within 7 minutes, Lansdowne Mall within 8 minutes and Yaohan Centre in 10. Also along this network is all of Vancouver, downtown Waterfront Station as well as YVR which is just ten minutes away. There will be a wide range of layouts presented at the VIP Previews for Cadence Richmond condos and they will include 1 bed, 1 bed+den, 2 bedrooms, Penthouses and even Townhomes. Here are some of the initial draft layouts that are subject to change at any time. When luxury is all around us, true wealth is achieved through strong health. That is why Cressey designed Cadence to be Richmond’s healthiest homes. Pure water. Fresh air – filtered and temperature controlled year-round. And the careful selection of finishings that keep your indoor living environment clean and elegant. Register today to learn more about the exclusive health benefits offered at Cadence. Best of all, Cadence promises healthy living year-round with over 32,000 square feet of indoor and outdoor recreation and relaxation space. Below is a sneak-peak of the podium rooftop garden, an exclusive Resident’s Only space for recreation and relaxation year-round. A lush, private garden inspired by elements of a Chinese Garden with the impressive Jewel Box Pavilion. The Oval Village promises to be a special community, and Cressey brings superior design and quality construction to homes worthy of their place in a modern, urban environment. Cadence will offer well-appointed One Bedroom up to Three Bedroom homes starting from the $290,000’s, plus stunning penthouses with private rooptop patios. Don’t miss out. Visit www.CadenceByCressey.com and Register Today for priority information on Cressey’s latest new home opportunity.